Money is not everything. If you think money is everything what would you say about this man. He is the only son of Tan Sri T. Ananda Krishnan (second richest man in Malaysia & Southeast Asia and 89th in the world according to Forbes). He refused opportunity to work with his father to expand his father’s empire (personal fortune more than USD 8 billion) and instead chose the life of a simple Buddhist monk 18 years ago. 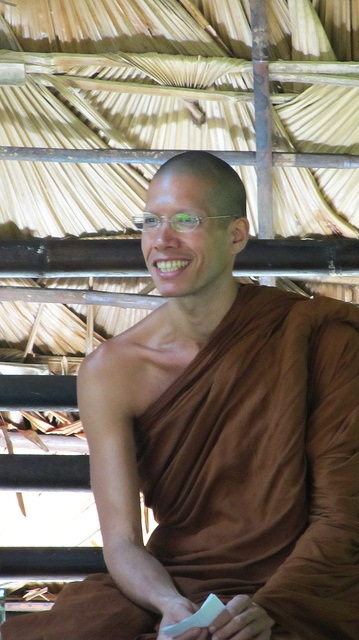 Until now he follow the path of the Thai forest meditation tradition. I was forwarded this video of Ajahn Siripanno by Sharon (Thank you Sharon) and watched. I liked it very much. I like very much how Ajahn Siripanno explained the teachings, effects on others to commit, personality and methods of conveying dharma of his teacher the great Ajahn Chah. I’ve never seen or met Ajahn Siripanno, but through this video I am so very glad he took ordination, studied, teaches and practices Dharma. May it continue strongly. You can see Ajahn Siripanno was destined to follow this path due to the ripening of positive merits. Through his explanation of his encounter with his teacher although brief and afterwards the effects, he weaves the dharma into the talk. Very skilfull, very beautiful and filled with truth. His teacher through great practice is able to bless and inspire so many others into committing towards dharma. I rejoice. I highly recommend everyone to watch these videos and contemplate. 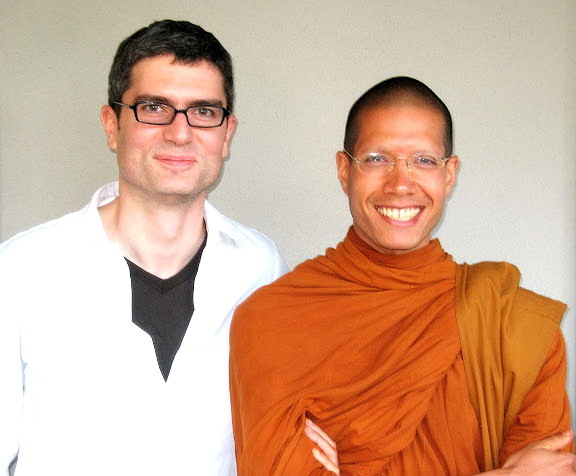 I personally wish Ajahn Siripanno a long life of practice and elucidating the Dharma. I pray Ajahn Siripanno will teach the dharma and reach many during his lifetime bringing their minds to rest in the forest of Nirvana. 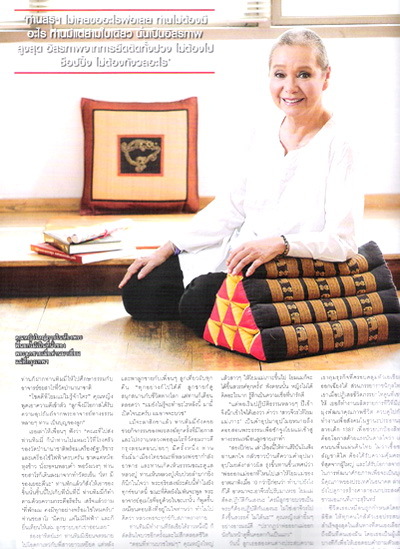 May Ajahn Siripanno’s dharma works flourish due to great compassion for others. Money is not everything. If you think money is everything what would you say about this man. He is the only son of Tan Sri T. Ananda Krishnan (second richest man in Malaysia & Southeast Asia and 89th in the world). 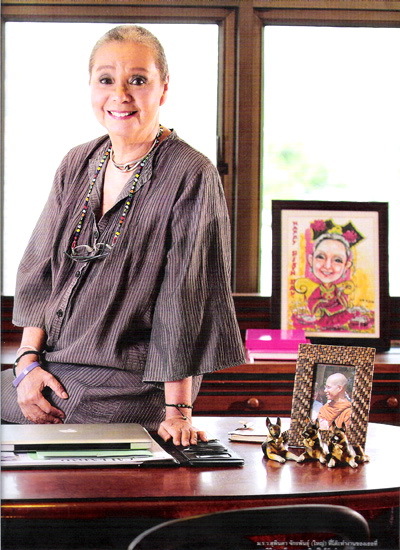 He refused opportunity to work with his father to expand his father’s empire (personal fortune more than USD 8 billion) and instead chose the life of a simple Buddhist monk 18 years ago. 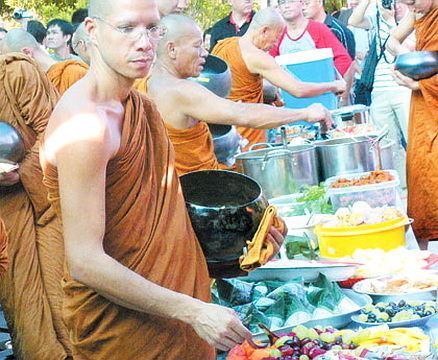 Until now he follow the path of the Thai forest meditation tradition. "ธรรมะเป็นปัจจัตตัง ต้องทำเอง รู้เอง เห็นเอง เข้าใจเอง"
ที่มา... ASTVผู้จัดการออนไลน์ 24 มกราคม 2556 19:26 น. The next morning, I met him in the hotel lobby and noticed that he was wearing the same clothes. “Excuse me,” he said politely and then looking at the young monk sitting next to me, said affectionately, “Son, it is time for us to go home.” The son obediently picked up his small cloth bag from the floor and followed his father. Earlier, curious to see a monk in the Uma hotel in Paro, I had started a conversation with him. 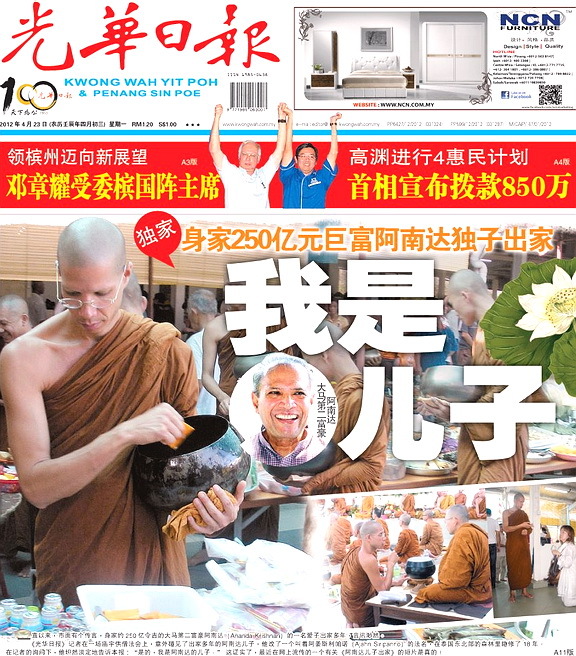 “Yesterday was my father’s 70th birthday and he wanted me to spend it with him in a special place,” the monk informed me. The monk could have been in his early thirties. He had short hair and was wearing saffron robes and had a pair of slippers on. “What a beautiful country you have? They had flown into Paro in their own jet. So who are these people? 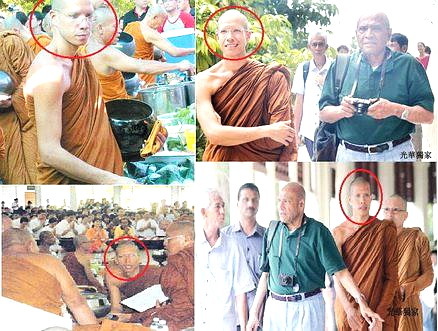 The elderly man is Ananda Krishnan and the monk his only son. Krishnan is the second richest man in Malaysia. According to Forbes he is worth 7.6 Billion dollars. The Tamil Malaysian of Sri Lankan Tamil origin is a self made man and is a notable philanthropist but leads a low profile life. He and his son are both Buddhists. Few years ago, the billionaire lost his son. He started to look for him and his search stopped in a Buddhist monastery in north Thailand. Shocked to see his son in saffron robes, short hair with a begging bowl in his hand the father invites his son for a meal. The son still lives in the monastery in the forest of Thailand and like all the monks in the monastery depends on other people’s generosity for his sustenance. Hearing stories like these one wonders if we are giving up everything that we already possess to acquire things that we really don’t need. This story clearly demonstrates that human contentment and wellbeing in real terms requires us to go beyond physical, mental, and emotional dimension. Krishnan’s son clearly shows that detachment could be a greater wealth and devotion a bigger asset in our lives.